Located 25 kilometres away from the city centre, Ma Rung Lu Quan Homestay will offer visitors a getaway from the hustle and bustle of urban life. 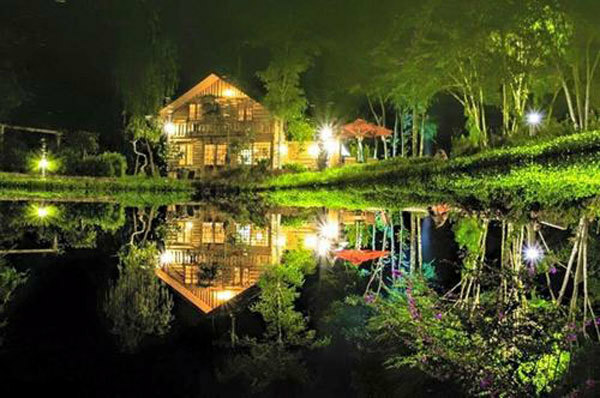 It features a lake and a variety of wooden houses. Surrounding the accommodations are beds of various flowers blooming in colourful shades. Visitors can fully immerse themselves in the natural beauty and enjoy the fresh air by the lake. The place is also ideal for groups and families to have a calming, relaxing experience. The Cu Lan Village sits by a clear stream with the water’s flow a murmured greeting to friends who stop to visit. You can enjoy fishing, climbing or sailing in the village. For coffee lovers, with open space and a 360-degree view of Da Lat from above, Me Linh cafe is popular with visitors, where one may enjoy delicious local coffee while hearing the wind and seeing the green fields below.